This lies at right angles to the Santiago River and in line with the entrance channel. 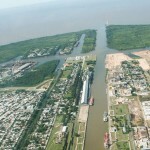 It is situated beyond the turning basin known as Cuatro Bocas (4 mouths), which is the junction of the Río Santiago, the entrance channel and the Grand Dock. The dock is about 2500 m long. On the Eastern side and beginning at pierhead, Tecplata S.A. is constructing a new prívate container terminal, planned quay frontage abt 800 meters and depth alongside 10,40 m (34 ft) at datum; expected to begin operations in 2013. At the end of this dock side “tomas” (oil pipe-line connections) Nº 1, 2, 3 are used by tankers. On the western side, the first 1200 m are not in use; of the remaining 1300 m, “tomas”(connections) Nº 6 and 7 are used for loading and discharging chemical products. Berths 7 and 8 are occupied by the Copetro petcoke terminal and berth Nº9 is an open quay berth for general use; it also includes a bonded fiscal area. The turning basin at the head of the dock offers a turning circle of about 170 m in diameter and is used by small vessels that do not swing at 4 Bocas, which latter has a turning circle of, 300 m in diameter with a depth of 8,54 m (28ft). There are ongoing plans to dredge the access channel and 4 Bocas to 10,40 m (34 ft), including widening the turning circle to 450 m; all this works are expected to be ready early in 2013. The Copetro private petcoke plant exports raw and calcinated petroleum coke by means of conveyor belts and a rail mounted dockside loading arm which can be positioned at any hold as required. The installations include two furnaces for converting pet (raw) coke into calcinated coke at the rate of 600 ton per day as well as 3 storage silos of total 30.000 ton. A large amount of petcoke, coming from both La Plata and Mendoza is stockpiled under covered storage. The majority of cargo exported is petcoke which in 2011 amounted to 520.000 tons. Depth alongside is 8,54 m (28ft) at datum. Vessel are sailing on 9.10m (30´) draft, waiting a tide of +0,90 m.
The YPF oil company have their refinery plant adjacent to the Grand Dock and nowadays all crude is supplied by pipeline from Puerto Rosales (Bahía Blanca) where tankers with crude oil from Argentina´s Southern oil fields discharge to a SPM Buoy. This means that tanker activity in La Plata is now confined to vessels loading clean refined petroleum products only, both home trade and exports. As necessary, due to draft limitations, vessels complete loading off the port at Zona Común(Common Zone lightening area) and at Zone C (Charlie) at the mouth of the River Plate. In 2011 at tanker berth (tomas) 1, 2, and 3, a total of 2,9 million tons were moved (Export-import and home trade), while at tomas 6 and 7, a total of abt 193.000 ton chemical products were imported/exported. Occasion demands, it is used by Siderar (owners of Puerto Rocca berth) to load their cargoes. Depth alongside 8,50 m (28 ft) at datum. Also improvements were made paving piers, installing fenders, demolishing old buildings and relocating facilities at premises.